Dizzy , I talk to trees and daisies , awestruck by the miracle of a new spring , one more time .Each spring is a miracle to me , and reborm, ideas flow through my head , swirling until I hear them like melodies , and I want to dance ; but they all want to fly . They expand in every direction , butterflies and bees …. My delight expresses itself in my love of creating beauty . I paint , I sculpt , and – I love to make magical Hats . And what more of a delight – my strange fascination with – Hats . I believe in Hats . Hats that can change the way you look to the world , and way you think , and the way the world sees you . Hats are objects of power , dreams and secrets are held there if they are special enough , and fantasy hats are the best if one’s intent is to make magic . .
Fantasy hats are always stitched by hand and created with love . . they have spells and incantations sewn in with their stitches . Fetishes and jewels hidden in silk seams . They are like visible dreams and spells put out to the world when one wears one … and can have great power … as every young girl knows , and as does every witch , and the wise shaman …. I love to wear , and to create Hats . When one takes a chance – and steps out of a comfortable anonymous zone , one opens the doors …. Suddenly the veils fade , reality changes , so subtly , welcoming whatever dreams you have been dreaming to step into your life …. A hat can transform its’ wearer …. i opening doors , casting spells , and bring magic into your life . modelled by Julia , a dancer with Kai Dance . small , but eloquent Where would bigness be without the small ? It is the detail that brings the smile , the finishing touch … the sense of whimsy . The detail brings sparkle , the light in the twinkle of an eye … the curl in the corner of a mouth … A love letter hidden in a bodice , and springtime reflected in a young girl’s eyes … and a little hat – on a pretty girl’s head , especially in springtime , is a delicious delight . a little thing , but such an eloquent statement … A wonderful bit of whimsy … a lace collar , a jewel , or an artwork of hat speaks , sings , and has a presence and personality all its own . 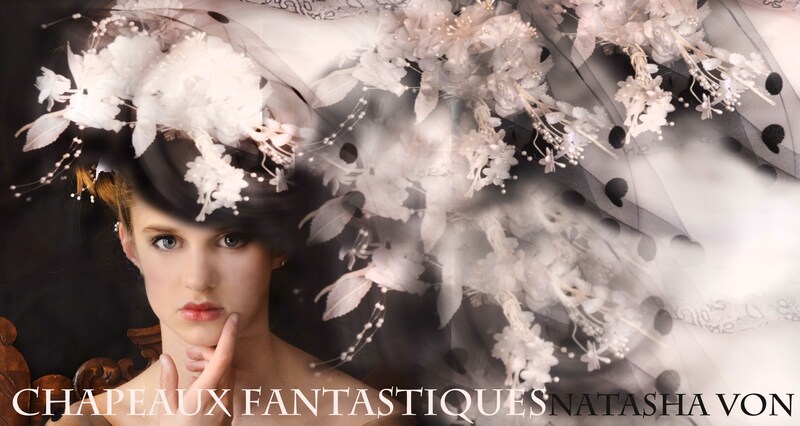 A small detail , and a small package perhaps , but with it comes amazing style …A silk satin chapeau , pearl embellished , trimmed with ostrich feathers ,hand made and fit for an heiress from the Great Gatsby Era , this little detail creates magic as soon as it is put on . Perfect in lieu of a veil for a very modern retro bride …. and for a Twenties style , Gatsby influenced wedding ensemble . Photographed and styled by the designer , and modeled here by Julia Fairchild. Holding the golden , glowing amber heart on a long golden chain , and letting it lead her forward ,Julie felt herself enter another dimension or what could be a parallel world . She felt a warm glow around her , and opened her eyes to find herself in a luminous place , full of golden light . Shining out the Light …. A joyous Solstice and Holiday Season to all , and a Glowing Yule .. keep the faith .. and keep shining out the light …with love . Julie , in the sky with amber and golden jewels … a hand carved honey amber heart , encased in silver arabesques and curls , sits in her fingers , capturing the light , and shining it outwards … On her finger , she wears a golden Lion , hand made and one of a kind , a sculpture in gold made by an artist’s hand , and cast . Pearls and coral jewels bedeck her crown , and a young deer’s antlers gathered by the native hunters in the forests of Quebec pay homage to the woodland Goddess who protects all animals and woodland spirits . Hat and jewellry hand made to order by Natasha Von ….available through Etsy … contact us for more information . Winter Solstice draws near . The holiday spirit makes us sparkle and glow , bringing light to the dark nights with the warmth of our hearts and loves . Rich velvets and embroideries , romantic silks , antique laces and satins gleam in the warm , afternoon light , adorning a retro and timeless woman , a Zhivagoesque Julie , shown dressed in Custom Couture fantasies designed by Natasha Von . Hand made , each Chapeau is unique , and one of a kind … as is each garment . And what better time than Christmas for tradition to mix with fantasy , and to celebrate times gone by , – with a delicious quixotic spin or two ?Or the New Year , to bring joyous delight , and whimsical magic into the year to come ? And in the spirit of an Enchanted Holiday , this charming duo , true Modern Romantics , are doing it right , and starting early ! And a black velvet and sparkling rhinestone Hat called Black Magic , a perfect fantasy in the spirit of New Year’s Eve …. All furs are lovingly restored , recycled , and recreated Canadian pieces .